- Order now and get 30% off the retail price! There is no worse feeling in the world than standing over your dead horse and being told that you could have saved their life, if you had only known what to do. In case after case, panicked horse owners fail to give their beloved friends the lifesaving treatment that they need to survive until the vet arrives. Written by a practicing Emergency Veterinarian with extensive experience, Dr. Chris O'Malley shares his secrets for emergency at-home treatment. Written in plain English and packed with real-world examples, Dr. O'Malley shows you how to confidently provide life-saving first aid to your horse. You will also learn about those indispensable items that you need to keep inside your equine first-aid kit. Join the ranks of competent horse owners and learn how to recognize illness and perform life-saving first aid procedures. When every minute counts, count-on this indispensable veterinary guide to help save your horses life. * Written in plain English and organized by body area. * Understand how to perform emergency diagnosis. * Learn how to perform emergency medical techniques at-home. * Read real-world stories of life-saving emergency treatment. * Identify the items that belong in your first-aid kit. Dr. Christian O'Malley graduated from NC State College of Veterinary Medicine in 1996. Since graduation, Dr. O'Malley has devoted his practice exclusively to equines. A large part of Dr. O'Malley's practice is ambulatory, so he is well rehearsed in all aspects of caring for the ailing equine in the field setting. Dr. O'Malley and his wife Dr. Amy O'Malley are the owners of Warrenton Animal Clinic, a mixed animal practice they started in 1999. Dealing with equine emergencies is a common occurrence for Dr. Chris since he is the only equine veterinarian available in the surrounding horse country. 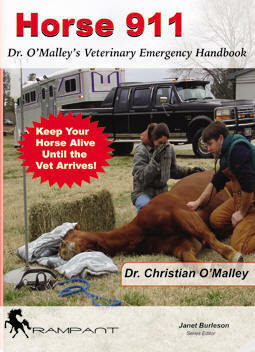 In 2005, Dr. O'Malley began to compile his experience and knowledge of equine emergencies into his book entitled "Horse 911: Dr. O'Malley's Veterinary Emergency Handbook". This handbook is packed with concise, easy to understand information pertaining to equine emergencies. The sole purpose of the book is to provide the horse owner an opportunity to help themselves and their horse in a time of crisis. Dr. O'Malley feels that horse owners in particular are more attuned to the health and care of their horses as compared to other pet owners. For this reason, he wants all horse owners to be knowledgeable in the well-being of their horse. On a personal note, Dr. O'Malley is an avid outdoorsman and enjoys hunting, fishing and camping. When he's not working he stays busy with his wife raising their three children.